Social media and blogs are famous for only showing the best of the best. Carefully curated images of stunning vacations, hearty meals, adorable children, and pristine living rooms. If you could smell what’s wafting from my stove right now… you’d be glad you weren’t in my house. Yes, I have an adorable baby, I do take some fantastic vacation photos (full disclosure, I have a degree in photography), and on occasion can bust out a photo-worthy meal. Yes, I make my own baby food, put care into decorating my house, and sometimes I get around to actually posting about the aforementioned things on my blog. But, as any mom human will tell you, everything can’t go according to plan. Let me preface by saying that I prefer to make baby food while Luke’s awake so that the food processor doesn’t cut a strong nap short. 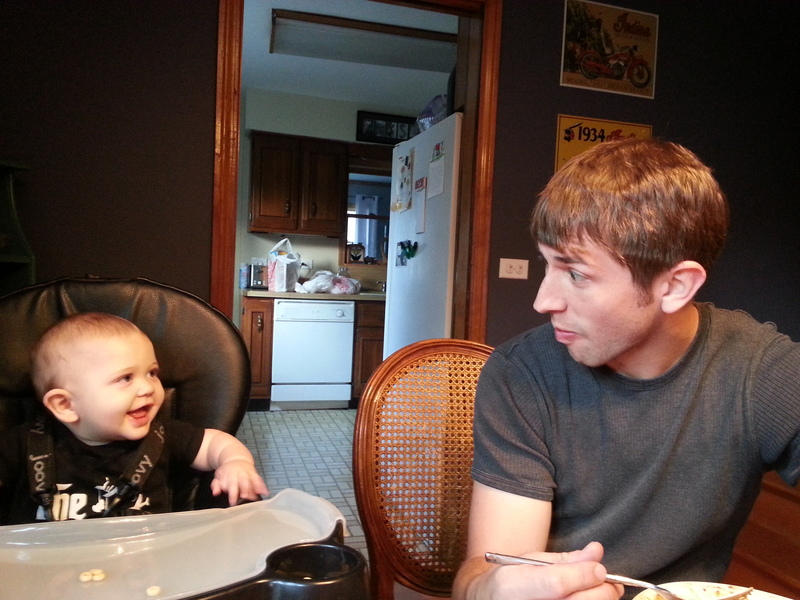 Plus, I can put him in his high chair and get at least two types of food made before he looses interest. That doesn’t mean I don’t still try to make 4-5 types of food (one day I’ll learn). I hardly count bananas as a thing because they require zero prep. Just peel and stick in the food processor. Everything else needs to be boiled soft before it can be turned to mush. 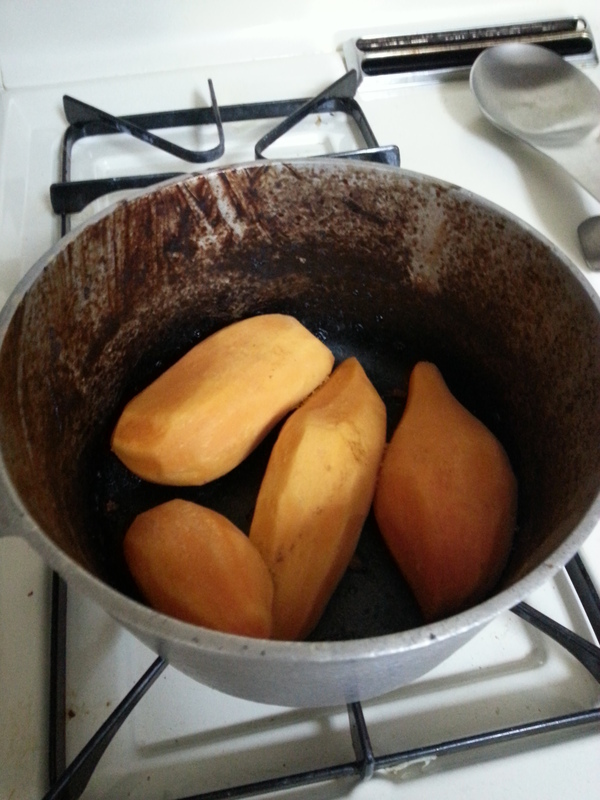 So with the bananas done and the squash and blueberries each boiling in their own pots, I started to peel the sweet potatoes. I set them to the side when I was finished, and pulled the blueberries off the stove, blended them, and poured them into containers. Since Luke eats more now, instead of using ice cube trays, I fill Dixie cups. Luke started fussing as I was putting my blueberry-filled Dixie cups into the freezer and I missed the shelf. 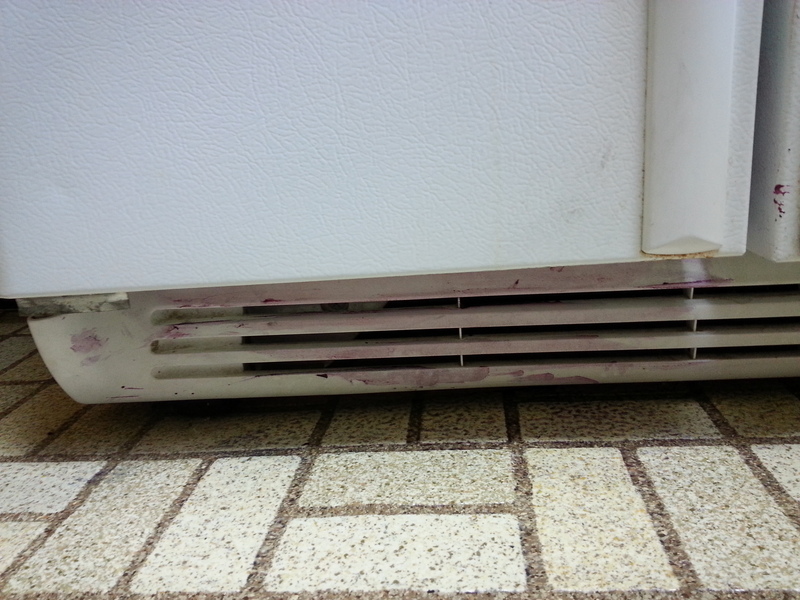 Warm blueberry compote spilled all over the freezer, my pants, and the floor. I had to jump into action to avoid stains everywhere. For the next several minutes I wiped blueberries off of the freezer and floor while Luke continued to fuss – he didn’t understand that blueberries don’t waste time staining everything they touch. Eventually I decided that the kitchen was ‘good enough’ and decided that the pants needed to get into the washing machine asap if they were going to be spared. After starting the washing machine, I put the sweet potatoes on the stove to boil and took Luke out of his high chair and into the living room to entertain him. While our kitchen fiasco was happening, the mail had been delivered. Luke decided that the Harry & David’s catalog looked good enough to eat tear apart, which was fine, he was happy. I sorted the rest of the mail and printed a shipping label. A faint smell of Thanksgiving came wafting from the kitchen. The sweet potatoes! A lift of the lid and Thanksgiving turned into that pungent smell that only burnt food cooked into the metal of the saucepan can produce. And typing that sentence just reminded me that the food that I set aside to be refrigerated for the next couple of meals is still sitting on the counter. One sec… and back. The pureed bananas look leopard print from being left out for the past hour. So here I am, typing this in a t-shirt and underwear (did I mention it’s laundry day overdue and I was wearing my last pair of clean pants – regular AND pajama pants included) waiting patiently for the dryer to buzz, in a house that smells like burnt food, with a baby going to town on the Harry & David’s catalog, my feet stained with blueberries and which are also now inevitably crusted into the portions of the freezer that I didn’t get wiped up immediately when I decided to stop wiping because my pants were more important (the pants were only a month old, and I do want a new refrigerator after all, haha). Oh well. At least I can cross ‘make baby food’ off my to-do list. Mike and I drove up to Wisconsin today. So did Kathy, Szy, Katie, Ian, Diana, Joe, Jim, Kelly, Sam, Bequita, Chad, Mik, Adam, Kaylee, Joe, Matt, Amy, Steve, Jeanna, Jenn, Shelley, Eric, Nick, Derek, Darren, Erin, Jake and so many more people that the crowd spilled from the church out into the narthex for seating, with several more streaming in via tablets from a few states over to as far away as Hong Kong. We were all behind Adam. Literally sitting behind him, and symbolically as a tribe of his friends, there to support him and mourn the loss of Nichole at her funeral. The word Tribe kept surrounding my thoughts today: as I listened to Adam’s breathtaking eulogy, her family, and our friends, also taking turns speaking heartfelt and hilarious memories; as I walked hand-in-hand with Mike while we followed the herse to the cemetery down the road; as we took turns tossing roses into the grave; and as we all gathered at a barn later to celebrate Nichole, at which time a rainbow formed the shape of a smile directly above us just outside of the barn. Somewhere along the way a group of students spanning almost a decade’s worth of graduating classes from the same suburban college (and a few of us non-alums who happened to make our way in via dating and marriage) took a shared love of the stage – be it on stage, back stage, or in the audience – and spun a network of deep hugs and even deeper friendships. As the coffin was being slowly lowered into the ground, I looked around at my friends, this tribe. We all grew a little bit older today. With tears streaming down our cheeks, we watched as our own young naivety was lowered into the grave alongside Nichole. It wasn’t supposed to end this way, not at 28. Tomorrow the sun will rise, we’ll hang up our black clothes, put tea bags over our cried-too-hard puffy eyes, and to put it as our friend Steve wrote, “we’ll honor the dead by continuing to live”. It’s been radio silence on the blog this past month, I feel like each week it’s something: post-vacation catch-up, catching a cold, giving that cold to Luke, but this most recent week it’s the worst of the worst, waiting for the phone call that says that a close friend of yours has passed away. The best way that I can describe Nichole is that she was really good at being a friend. She was excellent at keeping in touch, remembering little details of a conversation and then actually checking back in to see how whatever you mentioned panned out, and coming to visit. As someone who is really good at thinking to do those things, but never actually getting around to doing so, I can say that I really appreciated the effort that she put into every single one of her friendships. And she had a lot of friendships. If you happen to be friends on Facebook with anyone who was friends with her, you’d be reading some of the most beautiful sentiments from people who just lost a really great friend, and one very eloquently written post from her newly widowed husband. She touched so many people that when word spread that she wasn’t going to be leaving the hospital, folks started making travel arrangements to come into town to say goodbye. Frozen meals are being prepared, funds collected, and prayers said, as a whole community of her friends learns how to grieve for one of our own. 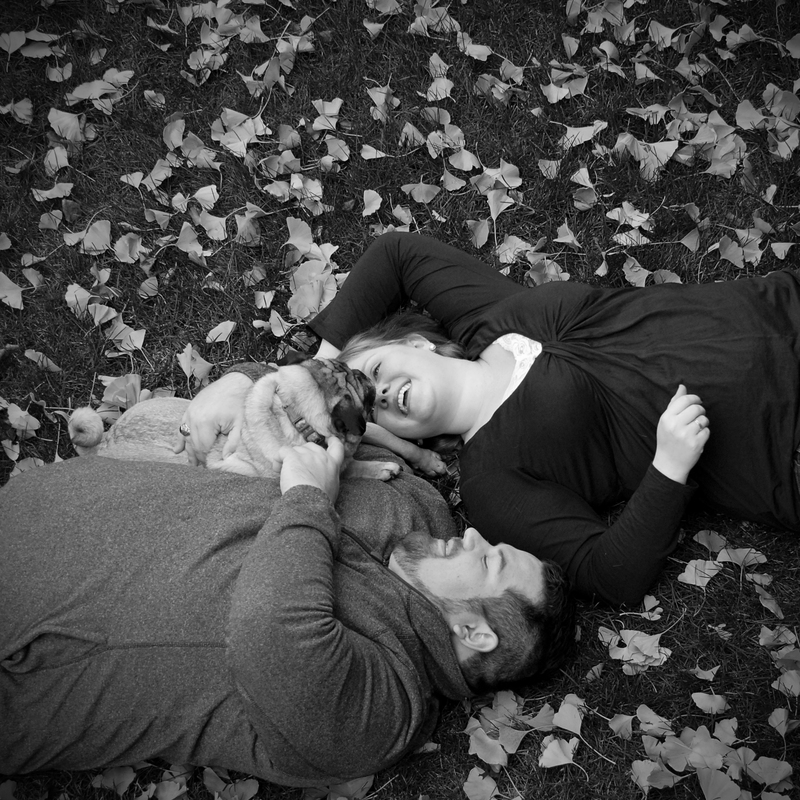 Nichole fought with stage 4 breast cancer for a little over a year. When all was said and done it had spread to her liver, back and lungs. She passed away less than a week shy of her 29th birthday. If you didn’t see her slowly disappearing, you’d never know she wasn’t going to make it. In every conversation about cancer that we had, she had optimism. Optimism for the next drug they were putting her on, optimism that she’d be walking for our friend Katie’s wedding, optimism that she’d be heading back to work in October, optimism that she’d hold on long enough for a cure to be found. Even a couple of weeks before she passed away she was calling the oxygen tank temporary and we talked about future chemo-holidays (being off chemo for an extended time if your numbers are low enough). I remain completely blown away by the grace that she possessed. Mike and I were fortunate to see her awake in the hospital one last time before she passed away last night. 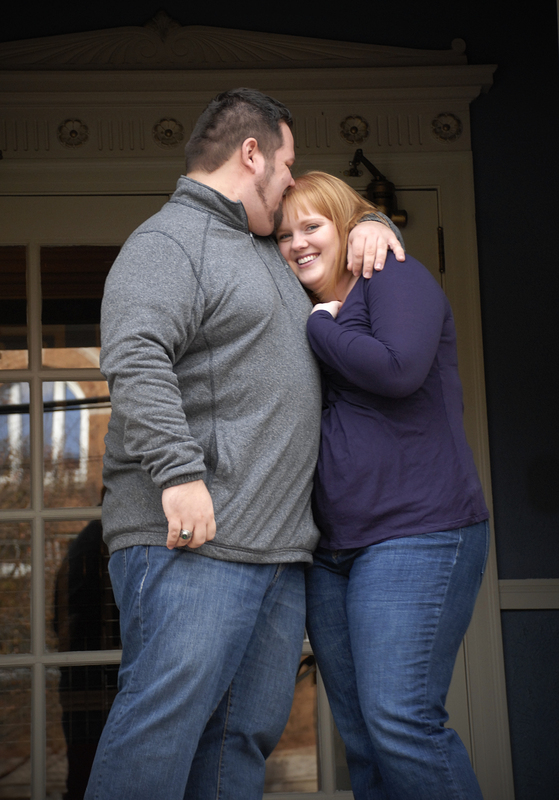 Even though she was struggling to stay awake, I got a trademark eye roll at a joke that I cracked upon kissing her on the cheek as we headed out of the room, I still smile thinking of that moment and the look she gave me. And then completely fall apart thinking of the last look that we gave each other, as I blew her a kiss from the doorway, somehow holding my composure in the moment. It was a beautiful end. Luke woke us up in the middle of the night a couple of nights ago, and after he was soundly sleeping again, I was left there in the darkness, awake and alone with my thoughts. I cried for Nichole, not knowing how she was able to handle knowing that her days were numbered in the low single digits as she said goodbye to all of her friends and family as they flocked to the hospital at her request. I cried for her husband Adam and her dad. I selfishly cried for myself, not out of pity, but out of anger that I never managed to visit as often as I’d wanted to, or text every time that I thought about checking in. I wanted to apologize for not living up to my friend-potential. There are two paramount things that I’m taking going forward, the first is to watch over my health like a hawk. Nichole was the one who inspired me to get my dark, raised mole removed and tested, even before she was diagnosed with cancer. She’d been on me about it since 2012, and I finally took care of it in spring of this year, I need to be more proactive about stuff like that. Second is to be a more involved friend to my friends. I need to take a page from her playbook and actually contact people instead of just thinking about contacting them. As a friend, she is the friend that I’ll forever aspire to be. 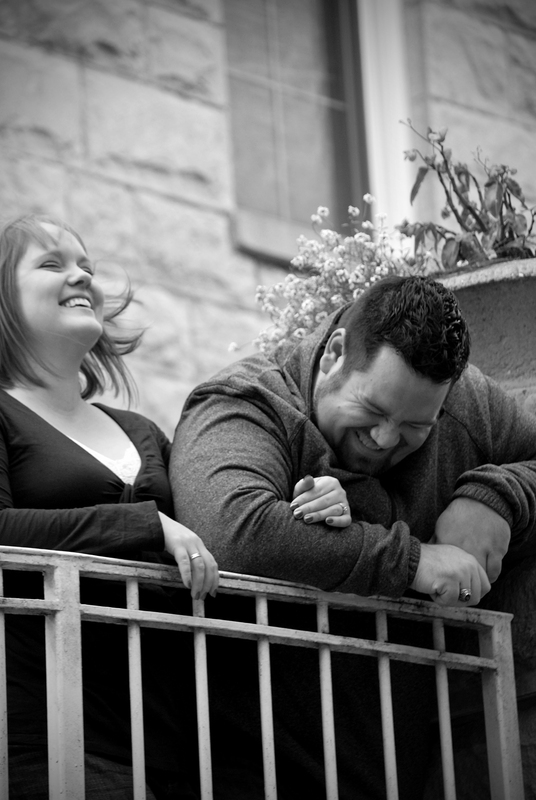 I was honored to do Nichole and Adam’s engagement photos, taken long before she knew she was sick. Here are a few more candid moments. 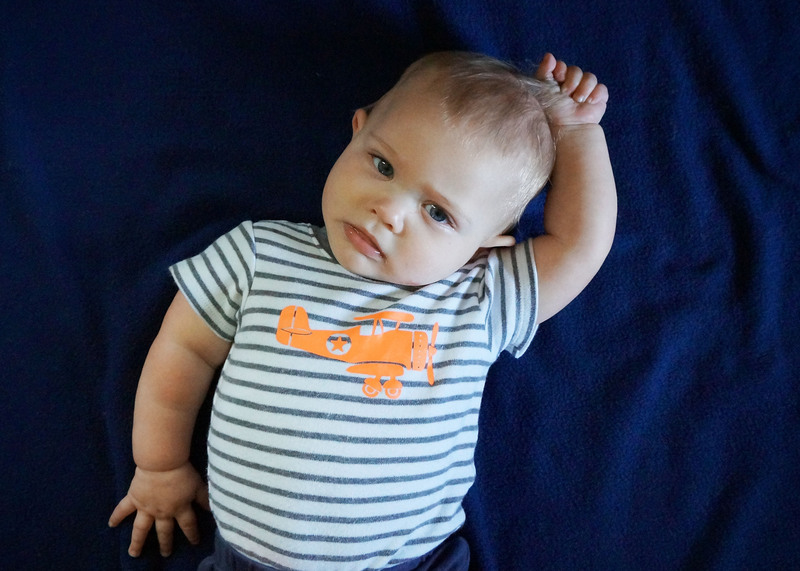 While Luke’s physical growth has naturally slowed down (he’s still getting bigger, but no longer at a growing out of onesies in a week pace), his developmental growth during June and July has been amazing to watch unfold. 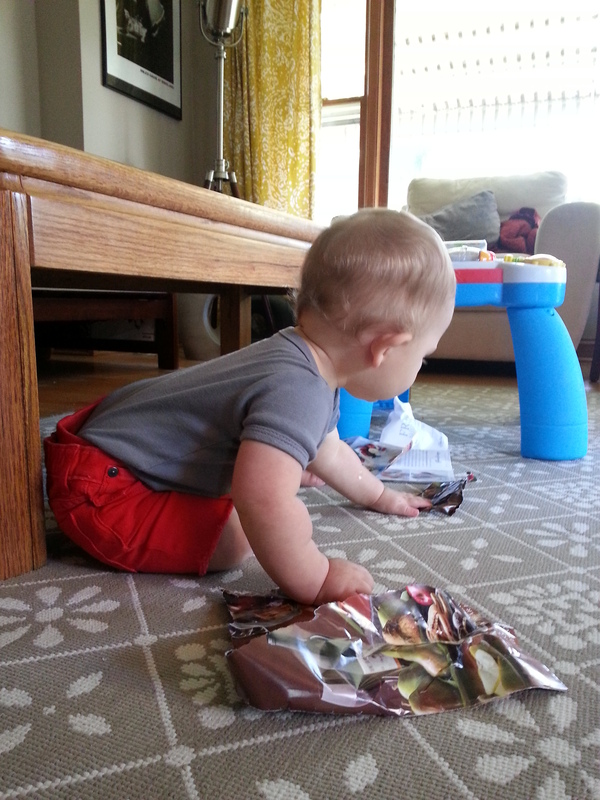 Not only can he stay seated, now he’s picked up getting himself into a seated position, Army crawling to get to a toy is now darting across the room to follow a person, and he’s actively working on pulling himself up to his knees. Luke is quite vocal and has been piecing together how to communicate with us. A lot of that communication entails patting things (usually one of our backs or the floor) to get attention or to indicate that he wants something. As of the past couple of days he’s also taken a new interest in his hair (see photo above). Another big area where we see daily development is Luke’s interaction with his toys. Some of them take a little more time to figure out (like the cash register that’s probably meant for a kid older than Luke), but we’ve yet to introduce something that he couldn’t eventually figure out. I was floored when he started hitting the correct buttons on the cash register toy and spinning this dial on one of his toy guitars. 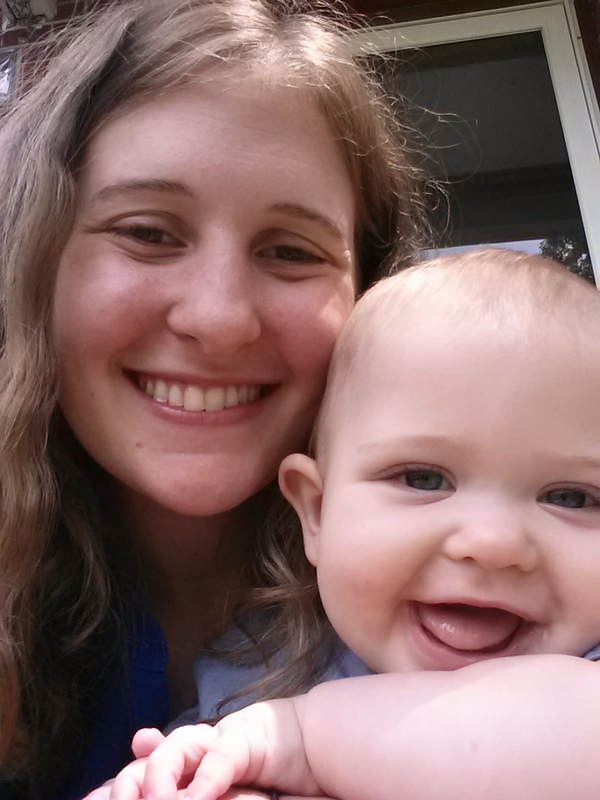 Luke has a healthy appetite and strong desire to try new foods. He and Mike have a dinner ritual where they sit next to each other while Mike shares tiny pieces of food from his plate with Luke. It looks like so far the apple hasn’t fallen far from the tree, Luke has tried a few of our dinners that have had a little bit of Franks Red Hot mixed in and loves it (don’t worry, it’s not too spicy if I’ll eat it). In addition to trying new foods, Luke has gotten to eat at new places. My grandmother Mimi has been in town and twice has gone out to brunch with Luke, Tory and myself (Mike tagged along the second time too). Taking Luke to public restaurants with indoor seating has been good practice for our upcoming vacation. We’ve learned a few helpful lessons: start packing smaller spoons in the diaper bag, ask the waitress to bring out Luke’s food (so far it’s been yogurt) before our food arrives, and that his attention span lasts until just before the check comes – so we’ll stick to one course for the time being. 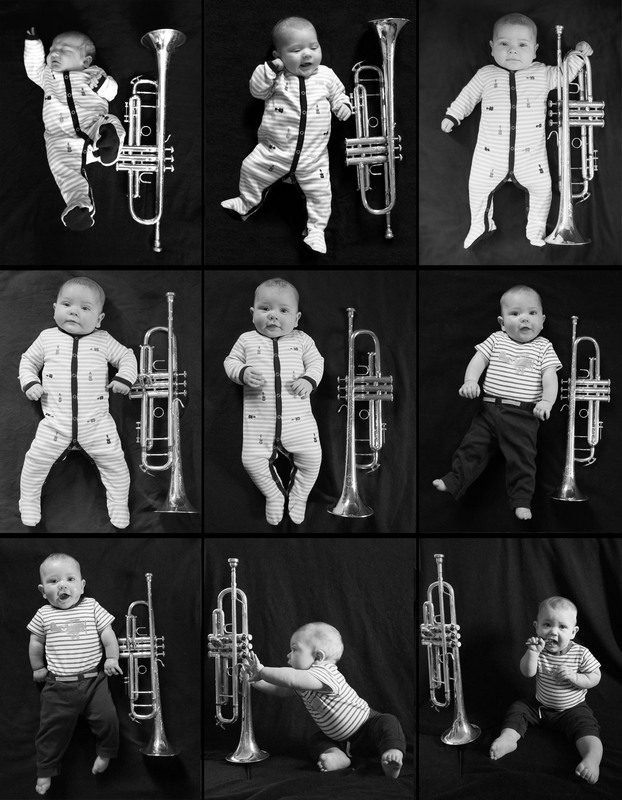 Taking the 8 Month Trumpet photos was an adventure (much like Month 7). Now that he’s so active, getting similar shots month to month is getting increasingly difficult. 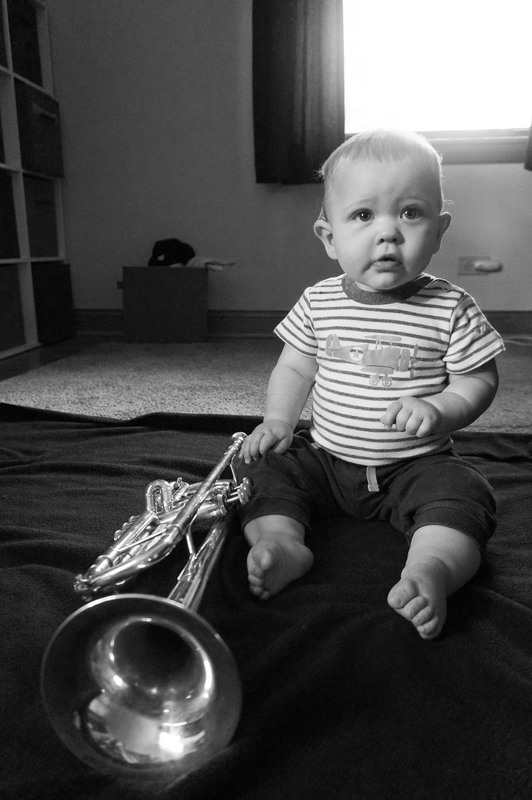 I think I took about 30 photos total today, instead of the 70+ from the months where he just laid still next to the trumpet. I just have to stay 3 steps ahead of him and work around whatever Luke decides that he’s going to do. 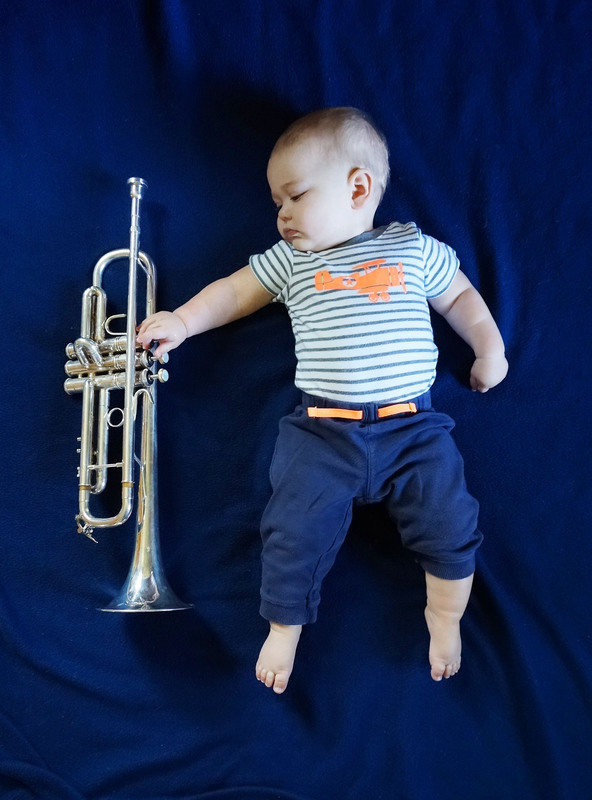 For example in the image above, I got about 3 photos of Luke in that position before he wanted to sit up on his own and touch the trumpet (like in the two photos below). He’s a very ‘busy baby’ and is pretty much only sitting still when we’re watching the street traffic or sleeping haha. 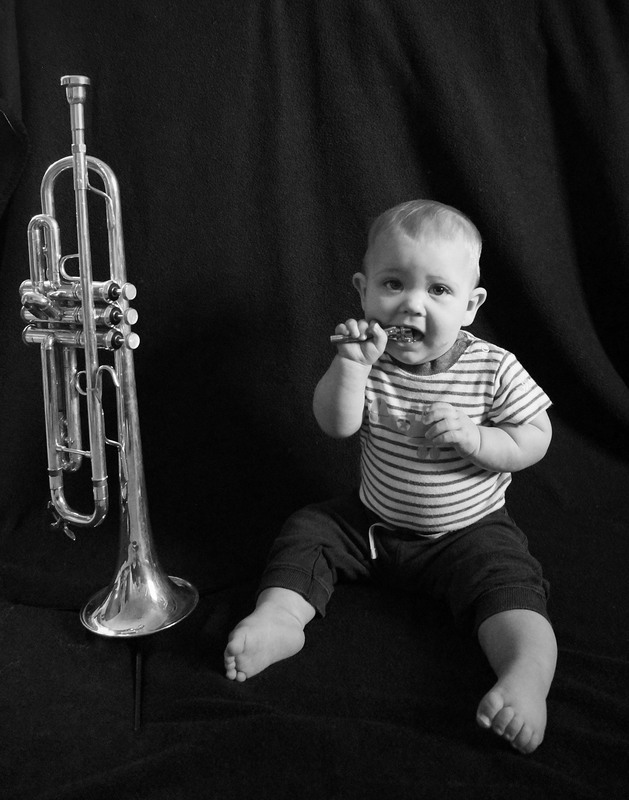 I did manage to snap a few shots of Luke sitting next to the trumpet like in Month 7. 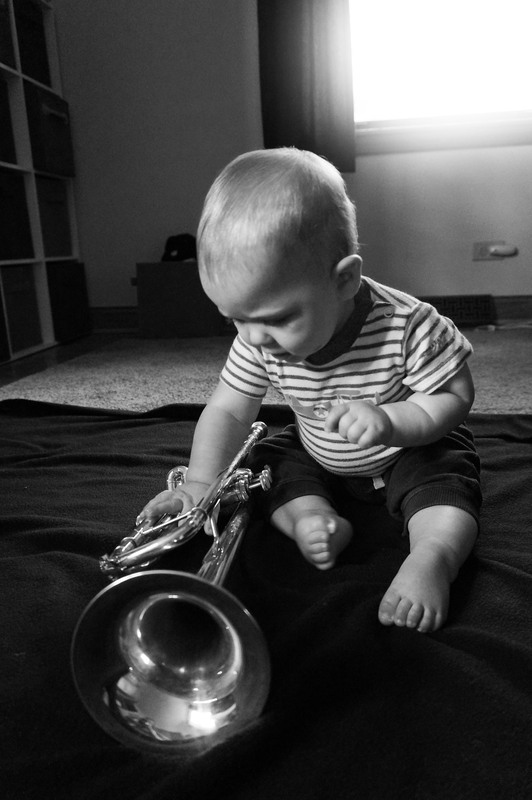 In order to keep him from repeatedly knocking the trumpet over (I don’t want Mike to nix using this silver trumpet which isn’t as nice as the the trumpet I was originally using, but apparently still a much nicer trumpet than the other two brass trumpets that we have), I gave Luke an extra trumpet mouthpiece to play with while he sat. It worked, phew! The only thing I need to make a mental note of for next month is to watch the angle that I take the photo, I think the camera was up higher this month than it was last month. The other evening after Luke went to bed I reminisced to Mike about how far we’ve come since Luke was born. How we had to wake up every couple of hours to feed him, how it took 45 minutes to wake him up enough to get him to drink. 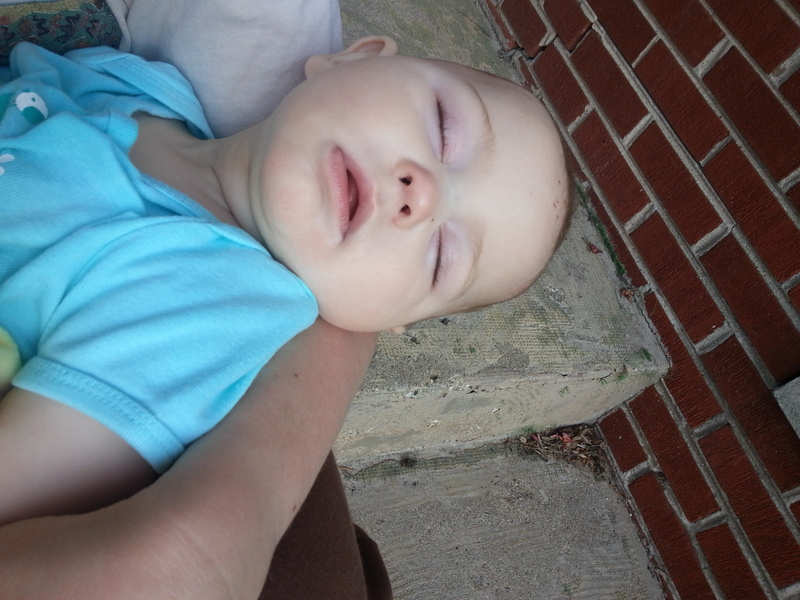 How we used to try to get him to stay awake for 10 minutes after he was done drinking, just so we’d have a little bit of ‘awake time’ with him before falling back to sleep. Mike was astonished at how quickly he’d developed ‘baby amnesia’ to the zombie-like state that we lived in those first couple of weeks. One of my favorite bloggers to follow frequently says that the age her daughter is currently is the most fun age yet, and now I get it. Each milestone brings a new level of fun and interaction to your relationship with your child, making each month that passes “the most fun age yet”. When you’ve got a newborn snuggled up in your arms you wonder how it could possibly get any better than that moment, then your 3 month old is smiling at you (or gas), then your 5 month old is hysterically laughing with you for a reason neither of you know, then you’ve got an 8 month old whose face lights up when you come in the room and reaches out his arms for you to pick him up for a hug. SYD: I didn’t make peaches, which ice cube tray was it in? SYD: you’re giving Luke butternut squash for breakfast. Thankfully Luke enjoyed the squash and wasn’t phased by eating it for breakfast. Luke and I have a favorite spot. It’s probably the ugliest spot on our property. In fact, before Luke was born I just pretended that it wasn’t there because it faced a fairly busy street and was in sorry shape. 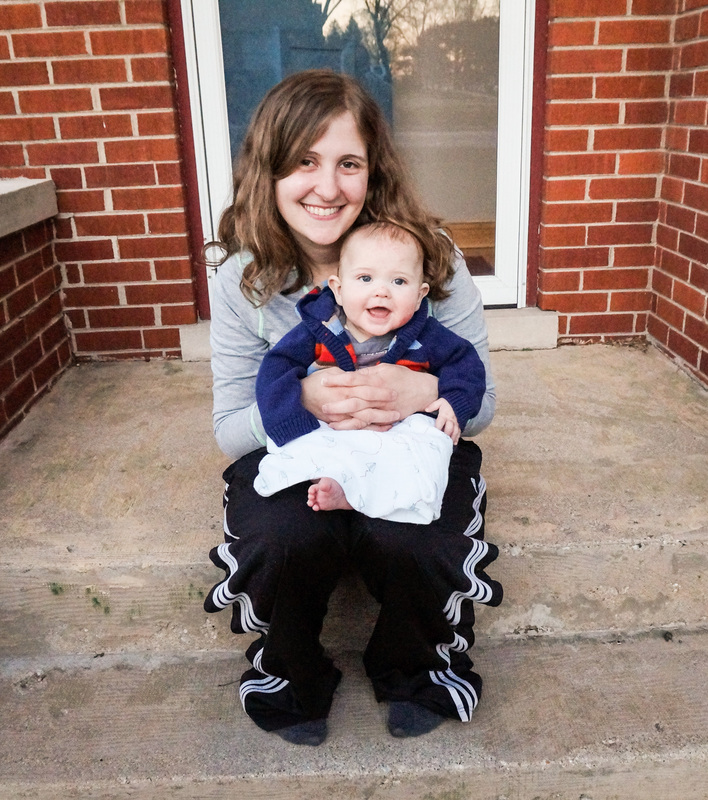 But when I’m sitting out on our front steps with Luke (sometimes others join us), on the crappy old concrete steps with tiny patches of green carpet that must have been there before we bought the house, it becomes the best seat in the house. 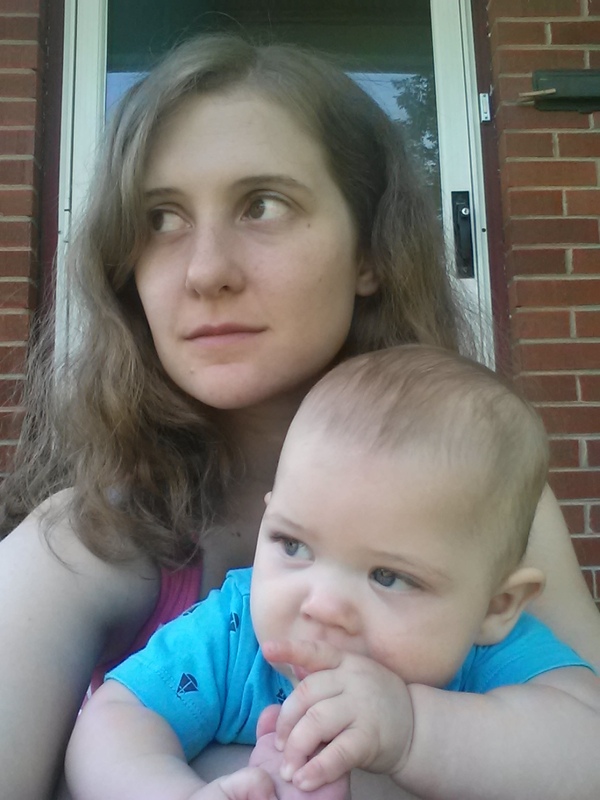 We watch the cars, calm down if one of us is getting cranky (Luke), and wave to passers by. The steady stream of cars provides audible and visual meditation. It’s a nice place to just enjoy being. I’d say on average we spend about 30 minutes each day sitting on the steps. Sometimes it’s early the morning as we watch the traffic pick up, late morning when people are out walking, early afternoon when Luke’s somewhere between awake and ready for a nap (there are days when the nap starts on the steps), and evening as we watch the sun fall behind the trees. Never mid-late afternoon though, the sun is just too intense on the steps during those hours. This morning Luke and I were on the porch bright and early. It was a little bit crisp outside in the mid-50s so we wrapped a blanket around us. Luke drank his bottle while I observed a tree that had been taken down yesterday several houses away (we saw them sawing off the branches as we sat on the steps yesterday early afternoon). The cars were just starting to appear, the whole scene was perfection. I started to feel a warm sensation when I knowingly looked down and noticed that Luke had just peed through his diaper onto us. Ah well (insert a knowing grin here), I took that as a signal that it was time to go wake up Mike. 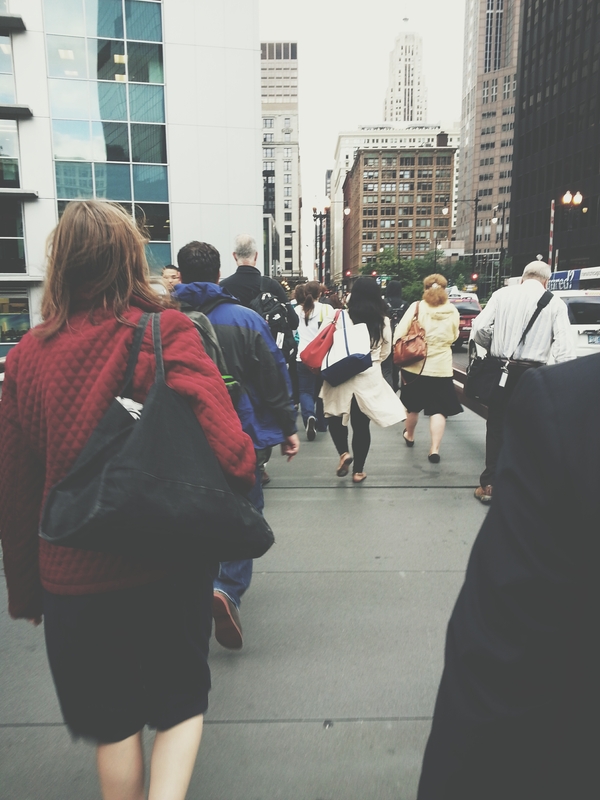 It’s smack dab in the middle of July, and I walked to work – chilled – wearing a blazer, humming Christmas carols (Oh, it’s beginning to look a lot like Christmas… good luck getting that out of your head for the rest of today). In theory, the temperature drop can be explained easily enough. Word around the internet is that the “Polar Vortex” from the endless winter of 2013/2014 has returned, bringing highs in the 70s and lows in the 50s. Personally, I LOVE it. Seriously, the 50s to the 70s in the Chicagoland area are absolute perfection. And they definitely beat our typical July weather, which usually has me sweating by 7am. Which leaves the explanation behind the Christmas carols playing on loop in my brain: while the rest of the country doesn’t get bit by the Christmas bug until the day after Halloween (or in some extreme cases, October 1st), crafters and retailer buyers are in full holiday swing by July 5th. Ever since early July, when I finally came up with the idea for my card line for Holiday Season 2014 (the late start was probably due to some combination of new-mom-brain and a busy wedding season), I’ve been feverishly painting (yes, painting) my card designs in any spare time that I can find… and all the while songs like Silver Bells and It’s Beginning to Look a Lot Like Christmas have been dancing like Sugar Plums through my head. Once the cards are finished and pitched to their respective retail buyers/loaded onto the Etsy and the soon-to-be-open shop on Studio255’s website, and the heat (regrettably) returns, I’ll have a few months to enjoy summer and early fall before the Holiday 2014 busy season kicks off.